A3 Size 10.7 x 15.2 in. (272 x 385 mm) 11.7 x 16.5 in. MEDIUM 14.8 x 21 in. (376 x 533 mm) 18.5 x 24 in. LARGE 19.5 x 27.6 in. (495 x 702 mm) 24 x 31.5 in. This complex painting by the Newar artist Raju Shakya depicts Red Avalokiteshvara in his thousand-armed and hundred and twenty-one headed form as Sristhikanta Lokeshvara. This is an extremely rare form of this Bodhisattva of Great Compassion, which to my knowledge has only ever been painted several times over the past few centuries. Amongst the hundred and eight manifestations of Lokeshvara (Avalokiteshvara) that appear in the Newar Buddhist tradition, there exist four principal shrines of this great bodhisattva in the Kathmandu Valley, where he is commonly known as Karunamaya, meaning the ‘Embodiment of Compassion’. The first of these four aspects is that of Red Padmapani Lokanath, also known as Rato Machhendranath, which is housed for half of each year in the Ta Bahal temple in Patan, and for the other half of the year in the village of Bungamati. This image is particularly venerated as a bringer of rain in times of drought. The second image is that of Red Anandadi or Adinath Lokeshvara, whose temple is located in the village of Chobar above the Bagmati River. This image is particularly venerated as a bringer of good health, luck, mental stability and emotional peace. The front of Anandadi’s temple is covered with metal pots, pans and kitchen utensils, which have been offered by newlyweds to ensure matrimonial harmony. The third image is that of White Arya Avalokiteshvara or Seto Machendranath, which is enshrined at Jana Bahal Temple in the heart of Kathmandu City, and both Buddhists and Hindus venerate the statue in this temple as a bestower of longevity. The fourth image is that of Sristhikanta Lokeshvara, located in the village of Nala near Banepa. Although Karunamaya is represented here in a similar white aspect to Seto Machendranath, this temple is actually dedicated to the two-armed red form of Padmapani as Sristhikantha, who is venerated as the supreme lord of creation. The title Sristhikanta Lokeshvara means the ‘Glorious Creator, Lord of the World’, and in this aspect he is identified as the Buddhist creator or stabilizer of our world system. The Newar Buddhist creation legend from the Swayambhu-purana describes how the eternal flame of the Adi-Buddha was concealed beneath the Swayambhu Stupa, and of how the goddess Prajnaparmamita Guhyeshvari first revealed herself in the form of an aniconic ‘reality source’ or dharmodaya. Then from the five-coloured lights of the Swayambhu Jyotirupa, or ‘Self-created Light-form’, appeared the Five Buddhas and their female consorts (prajna) as the Five Mothers. And from the ‘method-wisdom’ (upaya-prajna) union of the Five Buddhas and the Five Mothers there next arose their five great ‘Spiritual Sons’, as the bodhisattvas Samantabhadra, Vajrapani, Ratnapani, Padmapani and Khadgapani. Of these five great bodhisatttvas Padmapani, the spiritual son of red Amitabha Buddha and his consort Pandara, was considered to be the greatest. Through the power of his knowledge of this world and its living creatures, Padmapani then manifested many of the great Brahmanic gods and goddesses from various parts of his body in order to protect the inhabitants of our world. Because of this compassionate act he is traditionally represented in his red two-armed standing aspect as Sristhikanta Lokeshvara, who is encircled by the deities that he created. An early third or fourth century Buddhist text, known as the Gunakarandavyuha-sutra, describes how the Adi-Buddha (Vajradhara) first created Padmapani Lokeshvara from the ‘clear light’ of empty space. From his own deep samadhi Lokeshvara then created the Moon (Chandra) and the Sun (Aditya) from his right and left eyes, thus first establishing the cycles of night and day. Lokeshvara then created Mahadeva (Shiva) from his forehead, Sarasvati from his teeth, Brahma from his shoulders, Vishnu from his heart, Agni (fire) from his navel, Vayu (wind) from his mouth, Varuna (water) from his abdomen, Kubera (wealth) from his right knee, Mahalakshmi (good fortune) from his left knee, and Prithvi (earth) from the soles of his feet. To this list of twelve deities can be added Indra and Yama, who were respectively manifested from Sristhikanta’s right and left arms. The symbols of these fourteen deities surround the central image of Sristhikanta Lokeshvara’s modern torana that appear above the doorway of the Karunamaya temple in the Newar town of Nala. Here the small image of Amitabha Buddha appears above Lokeshvara’s head, with the discs of the Moon and Sun positioned to Amitabha’s right and left. Then mounted upon lotuses to Lokeshvara’s right are the descending symbols of: a trident (Mahadeva), a vajra (Indra), a book (Brahma), a citrus fruit (Kubera), and a tortoise (Prithvi): And descending on lotuses to his left are; a rosary (Sarasvati), a club (Yama), a flame (Agni), a treasure vase (Mahalakshmi), a flag (Vayu), and a serpent (Varuna). These fourteen deities are depicted in the same sequence given in my description of the two-armed form of Sristhikanta, which was painted by Kiran Joshi and is also illustrated in this ‘Buddhist Gods’ gallery of my website. These fourteen deities also appear in a similar sequence on the beautiful gilded image of Sristhikanta that appears above the golden window of the Malla palace in Patan’s Durbar Square. In painted images of two-armed Sristhikanta thin gold lines may connect the inner tips of the cloud-thrones that support the encircling deities to the points of Lokeshvara’s body where they have manifested from – although these golden lines are not shown in this painting. In this vishvarupa or ‘universal form’ composition of Sristhikanta the surrounding circle of emanated Vedic deities has been extended to sixteen by the inclusion of the two river goddesses, Ganga and Yamuna. Many of these deities appear upon their specific animals vehicles (vahana), and were essentially derived from the assembly of the ‘ten directional guardians’ (dasa-dikpala), who protect our world from demonic influences. These ten dikpala are: Indra (east); Agni (southeast); Yama (south); Nairrti or Rakshasa (southwest); Varuna (west); Vayu (northwest); Kubera (north); Mahadeva (northeast); Brahma (zenith), and Prithvi (nadir). Sristhikanta Lokeshvara appears here in his vishvarupa or 'all-pervading form', with a thousand extended arms and a hundred and twenty-one heads. He stands upright upon the seed-head of an open lotus, and his radiant red body is adorned with lower garments of multicoloured silk; a long green scarf that billows about his body and sides; a white sash that loops around his chest; and Lokeshvara’s characteristic emblem of a deerskin, which is draped over his left shoulder. He wears the golden ornaments of necklaces; bracelets, armlets and anklets; jewelled earrings and five-jewelled crowns, and around his neck hangs a long green serpent as a sacred thread, and a long garland of silver jasmine flowers. His hundred and twenty-one varicoloured heads are arranged in a pyramid of eleven tiers, which ascend in horizontal levels of twenty-one, nineteen, seventeen, fifteen, thirteen, eleven, nine, seven, five, three and one to create a stacked assembly of a hundred and twenty-one heads or faces. Each of these heads has a peaceful expression, with two eyes and a five-jewel crown – except for the wrathful three-eyed green head at the top; and the upper tier of five heads, with its green central head flanked by the heads of a green monkey and a red elephant to the right, and a white lion and a red boar to the left. 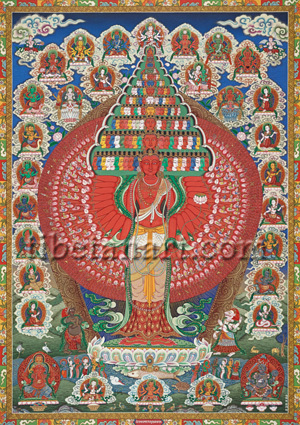 The seated form of red Amitabha Buddha crowns Lokeshvara’s pyramid of heads, with a canopy of twenty-five white naga-serpents enclosing the green halo that surrounds his pyramid of ascending heads. Lokeshvara’s thousand arms are all extended to form a fan-like arrangement of nine concentric circles. The first circle consists of twenty main arms; with his two principal right and left hands making the varada-mudra of supreme generosity and holding the stem of an open white lotus, while his other eighteen hands hold white lotus buds. All of these eighteen bud-holding hands point upwards; except for his second right hand, which makes the downward facing abhaya-mudra of protection. The next three concentric circles consist of twenty-four, twenty-six, and fifty secondary branch hands, which overlap loosely to form a broad ring of a hundred open-palmed hands. In the palms of these hands rest the forms of eight animals and ninety-two varicoloured gods, all of who kneel facing inwards with their palms-folded in adoration to Lokeshvara. The fifth circle consists of seventy-two secondary branch hands that each holds a different ritual implement, auspicious attribute or weapon. The four outer circles contain Lokeshvara’s remaining eight hundred and eight minor branch hands, which are arranged in four equal rows of two hundred and two hands that extend behind his legs and his pyramid of heads. Each of these small hands makes the varada-mudra of generosity or ‘method’, with the eye in each of its open palms representing Lokeshvara’s all-seeing ‘wisdom’ aspect. Seated in a row upon cloud-borne lotuses above Lokeshvara’s pinnacle of heads are the Five Buddhas of the five ‘Enlightened Families’, each having four-faces and eight-arms, with their two principal hands displaying their specific mudras. White Vairocana occupies the central position, with blue Akshobya (east), and yellow Ratnasambhava (south) flanking Vairocana to his right; while red Amitabha (west), and green Amoghasiddhi (north) appear to the left of Vairocana. Flanking this assembly of the Five Buddhas are two aspects of Manjushri. These are: red lion-mounted Dharmadhatu Vagishvara (right), with one face and eight arms; and red Namasangiti (left), with one face and twelve arms. In the upper corners of the painting are two winged gandharvas, or ‘scent-eaters’ with plumed headdresses, who each offer a bowl of jewels to Lokeshvara. And at the bottom centre of the painting is Manjuvajra, a golden-yellow form of Manjushri with one face and six arms, who is flanked on either side by his two four-armed consorts, white Keshini and yellow Upakeshini. Serving as guardians in the bottom corners of this painting are the four-armed dancing forms of red Ganapati and black Hayagriva-Bhairava. Red Ganapati is four-faced, four-armed and semi-wrathful in appearance. Bhairava is wrathful with four arms, and appears in the form of Hayagriva, with a neighing horse’s head crowning his terrifying face. Ganesh has a bowl of jewels in front of his lotus pedestal, while Bhairava has three skull offerings in front of his, and both deities are encircled by a stylized aura of wisdom fire. Standing in adoration to the right and left of Lokeshvara’s colourful lotus pedestal are the Hindu deities Varaha and Narasimha, who manifested as the third and fourth of Vishnu’s ten great avataras or incarnations. Varaha, ‘the Boar’, is brown in colour with the face of a wild boar, and he stands with his palms-folded in supplication. Narasimha, ‘the man-lion’, is white in colour with the face of a lion and four arms, the first pair palms-folded and the second pair holding Vishnu’s attributes of a conch and discus or chakra. The first and second of Vishnu’s ten incarnations, Matsya ‘the Fish’, and Kurma ‘the Turtle’, are represented by the fish and turtle that appear in the lake below Lokeshvara’s lotus, with the white conch shell also serving as a symbol of Vishnu. The fish, which appears below Sristhikanta Lokeshvara’s lotus throne, also serves to identify him with Machhendranath, the ‘Fish-Lord’, who is identified with the Shaivite ‘Nath Siddha’ Minapa, the guru of the Mahasiddha Gorakhnath, who according to legend brought rain to the Kathmandu Valley after a prolonged period of drought. Twelve small figures arise from the lake, each of which stand with their palms-folded in supplication to Lokeshvara. This aquatic assembly consists of the eight great naga-kings and four other attendant deities. Each of the varicoloured naga-kings has the lower body of a serpent and is crowned with the crest of a snake. The two white naga-kings are Padma and Varuna; the two yellow nagas are Vasuki and Shankhapala; the two red nagas are Nanda and Upananda, and the two green nagas are Suparna and Kulika. The two three-faced attendant deities to Lokeshvara’s right could be identified as white Rama and blue Krishna, the seventh and eighth incarnations of Vishnu: and the two to Lokeshvara’s left are monkey-faced Vanara and boar-faced Varahi. Encircling Sristhikanta Lokeshvara’s radiant form and jewelled aura are the eighteen Hindu gods and goddesses that he manifests from different parts of his body, each of whom appears upon a cloud-borne lotus throne. To the right and left of Lokeshvara’s upper tiers of heads are Sarasvati and Uma- Mahadeva, who were respectively emanated from Lokeshvara’s teeth and forehead. Sarasvati, the river-goddess of knowledge, is white with four arms, her first pair palms-folded and her second pair holding a rosary and book. Mahadeva (Shiva) is white with three eyes and holds the attributes of a rosary, damaru, trident and water-pot in his four hands. Mahedeva sits upon his bull vehicle Nandi; while his green consort, Uma or Parvati (Mahadevi), sits upon his left thigh, with her right hand making the varada-mudra of generosity and her left hand making the abhaya-mudra of protection. To the lower right and left of Sarasvati and Mahadeva are the complex two-armed forms of the white Moon-god, Chandra or Soma; and the red Sun-god, Aditya or Surya, who were respectively emanated from the right and left eyes of Sristhikanta Lokeshvara. Chandra holds the stems of two white lotus flowers before his heart, which represent the rising and setting of the moon, and he rides across the heavens in a golden chariot that is drawn by seven white geese. Ambara, his winged white charioteer, holds the reins of the geese whilst Chandra’s two golden and black consorts, Kanti (light) and Shobha (beauty), fire arrows of light into the sky to dispel the darkness. Aditya similarly holds the stems of two lotuses in front of his heart, representing dawn and dusk. Aditya’s golden chariot is drawn by seven green horses and steered by Aruna, his winged golden charioteer. On either side of Aditya are his two golden and black consorts, Prabha (light) and Chhaya (shadow), who likewise fire arrows towards the heavens. Aditya’s two wives may also be identified as Usha (dawn) and Sanjna (conscience), the latter of which gave birth to the first-born twin brother and sister, Yama and Yami. On each side of Lokeshvara are seven Hindu deities arranged in a vertical column, who all appear with their principal hands palms-folded in adoration. At the top of the column to Lokeshvara’s right is the green wind-god Vayu, who manifested from Lokeshvara’s mouth. Vayu is the directional-guardian (dikpala) of the northwest, his vehicle is a spotted antelope, and his hand attributes are a rosary and banner. Below Vayu is four-faced yellow Brahma, who emanated from Lokeshvara’s shoulders. Brahma is the guardian of the zenith or heavens, his vehicle is a white goose, and his hand attributes are a staff bearing his rosary and book, and a golden water-pot. Below Brahma is the fire-god Agni, who manifested from Lokeshvara’s navel. Agni is the dikpala of the southeast, his vehicle is a ram and he is usually red in colour, and he may be described as having two faces, three legs and seven tongues. But here he appears with a green complexion and bears the attributes of a rosary and a victory banner. Below Agni is blue Vishnu (Narayan), who emanated from Lokeshvara’s heart. Vishnu is mounted upon his red garuda vehicle, and his hand attributes are a chakra and a club. Below Vishnu is a two-armed red king wearing a turban and mounted upon a tiger, who may possibly be identified as Dhanada, the wealth-deity and treasure-guarding king of the yakshas. Below this tiger-mounted king appears another regal figure wearing the robes and crown of a Nepalese king, who possibly represent Indra as the king of the gods and the dikpala of the east. Below and at the bottom of this column is the two-armed white earth-goddess Prithvi, who manifested from the soles of Lokeshvara’s feet. At the top of the column to Lokeshvara’s left is the white river-goddess Ganga, who sits with her palms-folded in adoration. Below Ganga is the matrika or mother-goddess Brahmani, the female counterpart of Brahma, whose vehicle is a white goose. Traditionally Brahmani is usually yellow in colour, but here she appears with a white complexion, and with her second pair of hands she makes the varada-mudra of generosity and holds a mirror. Below Brahmani is golden Mahalakshmi, the mother-goddess of wealth and good fortune who was emanated from Lokeshvara’s knees. Mahalakshmi’s vehicle, a golden tortoise, appears just behind her right knee, and with her second pair of hands she makes the varada-mudra of generosity and holds a golden sinhamu or Newar powder-container. Below Mahalakshmi is the white water-god Varuna, who was emanated from Lokeshvara’s abdomen. Varuna is the dikpala of the west, and his vehicle is a makara or water-monster (crocodile). His head is crowned by a white naga-serpent, and his hand attributes are a conch shell and a serpent-noose. Below Varuna is Kubera the yellow wealth-god and dikpala of the north. Kubera’s vehicle is a horse, and his hand attributes are a citron fruit and a club. Below Kubera is Yama, the black ‘Lord of the Dead’ and dikpala of the south. Yama’s vehicle is a black buffalo, and his hand attributes are his club or ‘staff of death’, and his rope noose. Below Yama and at the bottom of this column is white two-armed Ananta, the king of the nagas and guardian of the nadir or underworlds. Ananta has the lower body of a serpent and his head a crowned by three naga-serpents. The rectangular inner torana that surrounds the landscape of this painting is decorated with triangular sections that contain half-lotuses, while the narrow torana that surrounds this is decorated with coloured sections that contain the brocade-like motifs of flowers, clouds, flames and jewels.